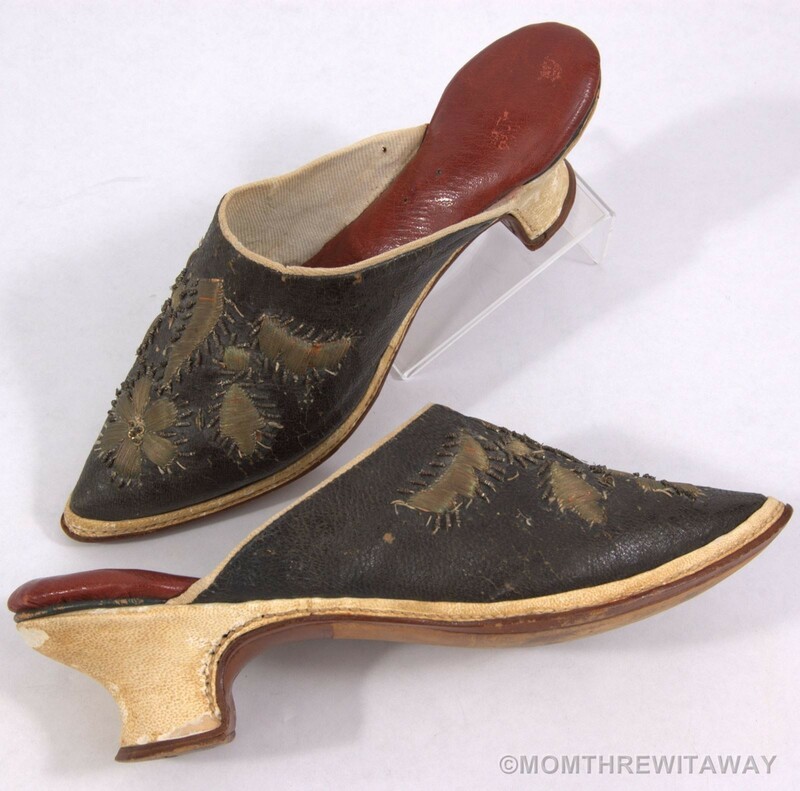 DESCRIPTION: Absolutely stunning pair of antique or vintage black and ivory cream ladies mules or slipper shoes with elegant gold metallic thread embroidery and a shapely louis heel. 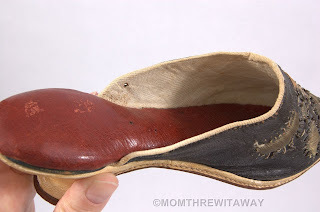 The body of the shoe is black leather over canvas or cloth, the heel and trim appear to have once been a soft ivory kid leather, and the insole is a padded red leather with a hint of green leather sandwiched between the louis heel and red insole. The ornate embroidery is gold metallic threads wrapped around orange red silk thread, and there are little pieces of gray metal also wrapped around thread or string for a bead like effect. 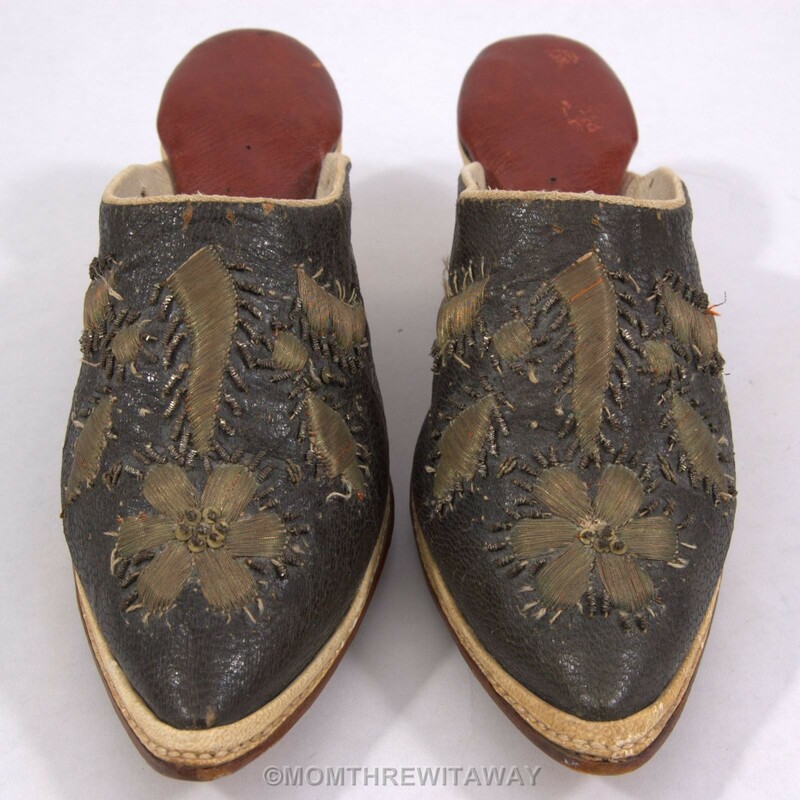 The center flowers near the toe of shoes have what appear to be brass metal sequins. 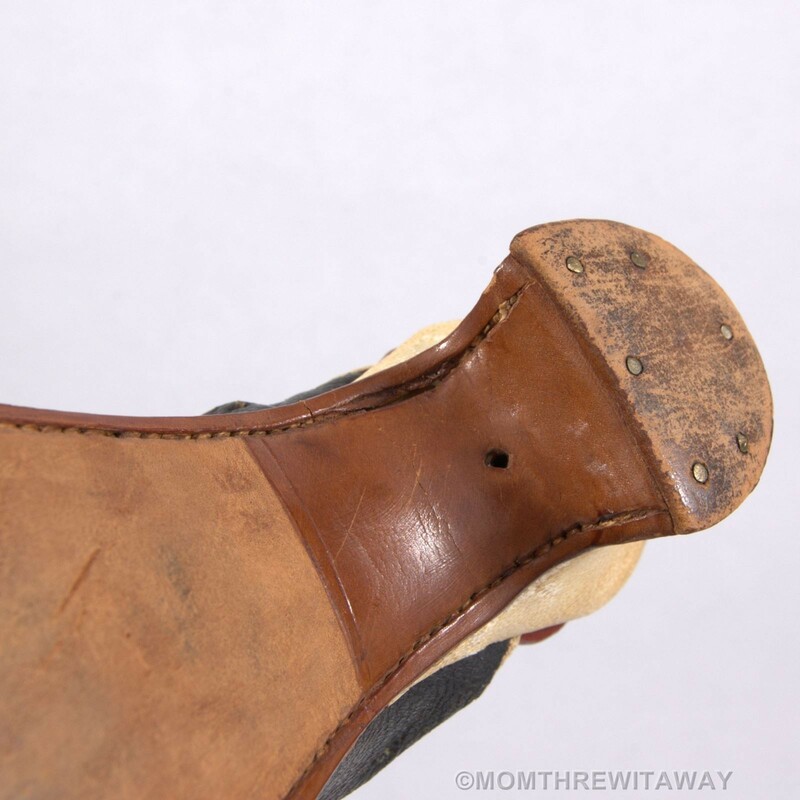 There are 2 very small holes on each side of the back part of the shoe perhaps for a decorative tie around the heel? The shoes are quite small and narrow by today’s standards. 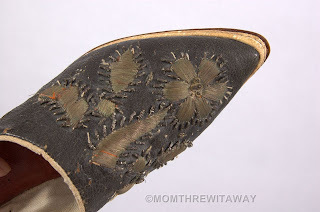 These could possibly be French or European, as the bottom of shoes are stamped 35, and there is also remnants of a paper label on the soles. We are unsure as to how old these are, but they look to have much age, even though they appear to have had very little use. 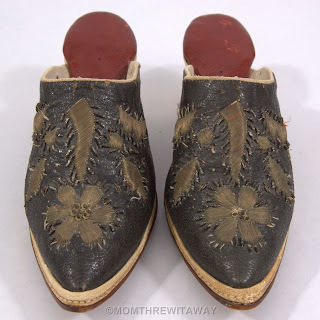 Please note that these shoes have a strong “old or antique” odor, for lack of a better word. Please feel free to ask any questions you may have since we are unsure of exact age or origin. 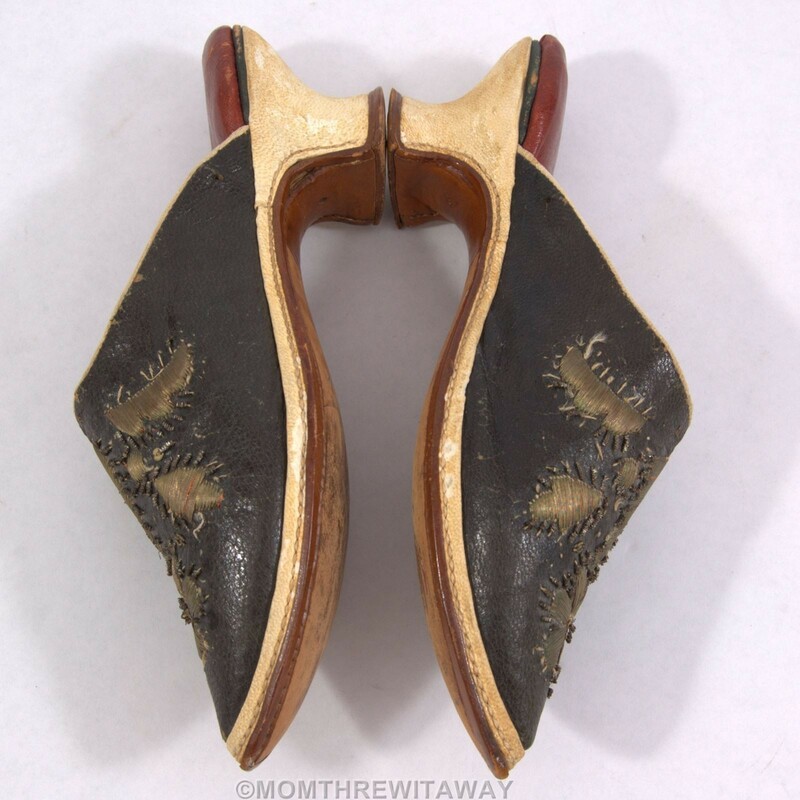 SIZE/WEIGHT: Approximately 9 3/8”-9.5” from tip of toe to heel. Widest point on sole is 2 7/8”. Stamped 35 on bottom of both shoes. 7.25 oz. 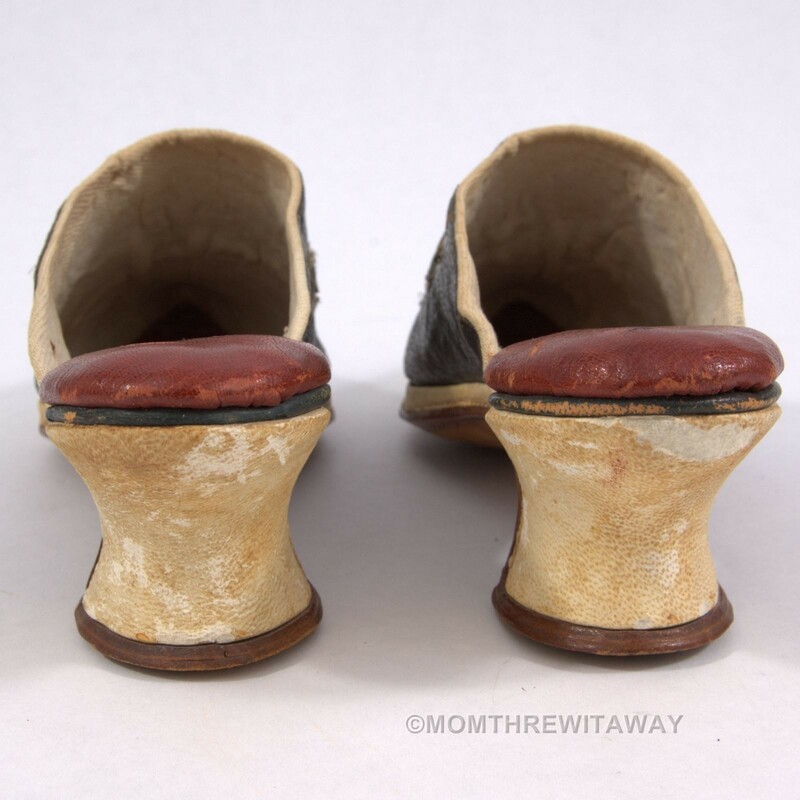 CONDITION: In our opinion these are in Good - Very Good vintage condition. We have not done anything to restore the leather, it is as found. The black leather is dry and has some cracks and wear. The cream trim and heels have yellowing, and wear, with one shoe having 2 large areas of wear and one area by corner of the heel is actually missing the leather altogether. 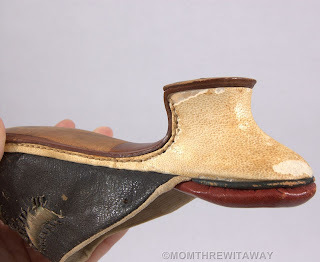 That same shoe also has an area of separation or a split on the underside by the heel where the stitches were. The lined canvas or fabric inside has some light aging, and the red leather insoles have a few wear spots and small tears. There are missing gray metal trim pieces around the decorative gold thread. I really don't know if these are 18th C or not...methinks not but that's not really based on anything substantial. Anyone have any idea of when these babies are from? The way they're put together is consistent with 18th century techniques. BUT... They don't look *quite* right in the relationship of the upper to the sole, the proportions of the welt or the level of finish to me, and I'm pretty sure the brass nails in the heel lifts are a 19th century thing. I can't tell from the pictures if they are "straight" or not. They *should* be. Such things were made and used much later than when they were fashionable in western Europe in parts of what was then the Ottoman Empire. I can imagine them hanging in a market stall in Constantinople to temp Victorian tourists.